I have found that my iPhone is an invaluable aid in my work as a Baptist minister. This article describes a typical day in my personal and professional life. 6:45 a.m.—My iPhone wakes me up so I can take my son to school. On the way, we open the Mantis Bible Study (Free; mantis bible.com), a great little app that allows us to read a verse of scripture on the way to school. 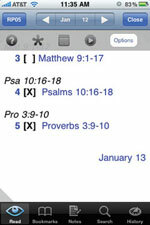 I really like the app’s daily Bible reading tracker, which reveals progress in your Bible reading. We are following the Daily Reading Plan 05, which divides the Old Testament, New Testament, Psalms, and Proverbs into 365 readings. Mantis Bible Study is free, and includes the full King James Version of the Bible. Mantis Bible Study is the best app I’ve found for tracking daily Bible reading. There are a number of free Bible apps available for the iPhone or iPod touch. 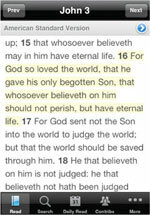 Check out BibleReader-Free (olivetree.com) and PocketBible Free (laridian.com). Both include the KJV Bible along with daily Bible reading and devotionals. However, Mantis does the best job of keeping track of your readings. 7:45 a.m.—After I drop off my son, I head to a local coffee shop for a bagel. The fifteen minute drive is just enough time to listen to iDevotional ($9.99; christianaudio.com/iPhoneApps), a great app with two of the world's most popular devotionals: My Utmost for His Highest by Oswald Chambers and Morning & Evening by C.H. Spurgeon. If streaming over the Internet is not practical, go to the iTunes store and get a devotional podcast or audiobook. 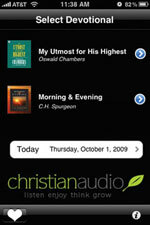 iDevotional lets me listen to morning devotions streamed directly to my iPhone. 8:15 a.m.—At the coffee shop, with bagel in hand, I boot up my laptop and fire up Twitter. It’s a great way to keep up with friends, family, and other ministries and to follow news from Bible study application developers. Finally, I use it to follow some of my denomination’s leaders. The morning I wrote this, there was a tweet from Rick Warren (@RickWarren), the author of A Purpose Driven Life. He always has inspiring things to say to preachers. I use Twittelator Pro ($4.99; stone.com/Twittelator) to find people who are tweeting nearby and invite them to talk face to face. I have discovered a handful of contacts who are now good friends. I love the way it allows me to follow conversation threads and its ability to upload pictures that I tweet to my WordPress based blog. Twittelator makes it easy to follow conversation threads and upload photos to my WordPress-based blog. 10:30 a.m.—I’ve been studying at the coffee shop and working on a sermon for nearly two hours and I need a break. I check my e-mail on my laptop and use the Kindle For iPhone (Free, amazon.com) app on my iPhone to read a chapter of a book that I’m going through. I find that if I stop and think about something else for 30 minutes, I can go back to my sermons and Bible study, refocused and more productive. 11:45 a.m.—After a morning of study, my iPhone reminds me that I have to go to a meeting of the officers for our local ministers’ group. 12:10 p.m.—I make it to the meeting a little late, so I reset my calendar reminders on the iPhone to 30 minutes before the meeting instead of fifteen. Thanks to Google and my iPhone’s syncing capabilities, all my appointments are sent to my Google calendar and appear in all my calendars. At the meeting, I open Evernote (Free; evernote.com) on my iPhone and check last month's meeting notes to see what we have to cover this month. 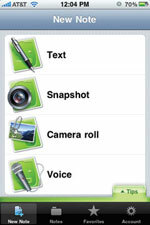 Evernote not only lets me create text, photo, and audio notes, it makes it easy to sync them with my account on evernote.com and, through that, with the Evernote program on my laptop. It's also a great way to record expenses; I simply take a photo of a receipt and sync it..
1:15 p.m.—I head for the home of one of our church's shut-ins. She is not closely tied to the church and I haven’t visited her before, so I enter her address into MobileNavigator North America ($69.99; navigon.com/iphone). The app is accurate, easy to use, and much safer than Maps. The GPS signal drops out on occasion, but so far this hasn’t been a problem. 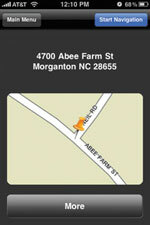 MobileNavigator is an accurate and simple GPS navigation program that provides audible, turn-by-turn directions. While visiting with this dear lady, I want to encourage her. I remember the verses I read with my son that morning and thought they were appropriate for her situation. I open Olive Tree’s BibleReader and read them to her. She asks what one of the words means, and I’m not entirely sure about it. Fortunately, I have Olive Tree’s Greek and Hebrew Bibles installed on my iPhone. This app, GNT and BHS for BibleReader ($46.99; olivetree.com), has a pop-up dictionary that gives you the root meanings of the Greek and Hebrew words used in the oldest versions of the Bible. I open the Greek text in a second reading window and tap the word to look it up and clarify the meaning for her. The verses encourage her and I want to remember them so I bookmark them in BibleReader for future reference and add a note in Evernote so I can easily come back to them later. 3:30 p.m.—I have an appointment to meet with a couple in need of some marriage counseling. I require some information about them, which I store in a database about each church member. I could not remember the names of their grown children so I access the database using a church management program called iChurch ($49.99; (slingandstaff.com). 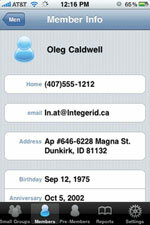 iChurch lets me access my church management software database from the iPhone. iChurch lets you connect to your church management system. The latter is software that runs on your server and tracks members, attendance, giving, and other activities. I open iChurch on my iPhone and find the names of their children. I also notice that the husband’s birthday is tomorrow, so I quickly scribble a note on a blank birthday card. (I keep a number of them in my desk just in case.) When they do arrive, I hand the card to the husband and wish him a happy birthday. I counsel the couple for about an hour, and during the meeting I share with them a helpful passage from a book on marriage entitled For Men Only (the companion book is titled For Women Only). Before the appointment, I downloaded the book onto my iPhone Kindle app and bookmarked the spot I wanted to read to them. I also want to share some scripture verses with them, so I open Laridian’s PocketBible to find them—it’s the quickest Bible app. Finally, I use Evernote to take notes during the meeting. I’ll review them before, and have them available during, the next meeting. 5:00 p.m.—It's Friday, and I have a date with my wife. While we’re getting something to eat, we review possible movies using Flixster (Free; flixster.com). It’s a great app that provides movie reviews and the location and show times for theaters in our area. You can also watch trailers of the movies that interest you. It even lets me add movies to my Netflix account so I can get them in the mail later. Tip: If a movie hasn’t been released to DVD, add it to your Netflix list anyway. When it finally comes out on DVD, it becomes active and Netflix sends it out right away. 10:00 p.m.—It's late and I'm tired. I check out Twitter one last time and post about the movie we just watched. I respond to an e-mail I got from a church member while in the theatre. I open My Prayer List to pray for the people on the list and read a portion of scripture using Mantis. 10:02 p.m.—My iPhone starts to chirp. I have set it to go off at 10:02 to remind me to pray Luke 10:2, a passage that asks God to “send out people into the harvest,” meaning to send out believers who will help meet the real needs of the world. It makes me think about doing a sermon on that subject, so I open up my fourth favorite Bible app, Logos Bible (Free; logos.com/iphone). This app is a powerful Bible study tool that lets you access and search 30 free Bibles over the Internet. You can access more books by signing up for a free account. I particularly appreciate Logos Bible’s search feature. It lets me enter the topic in which I’m interested and search my entire online library for references to it. 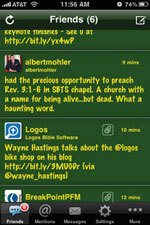 You can read them on your iPhone and access them later using Logos 4, the desktop version of the program. It has been a full day and along with my iPhone’s battery, I am spent. It's time for some rest so I make sure my iPhone is set to go off in the morning so I can do it all over again with the help of the best electronic assistant a pastor could have. Logos Bible has a great search feature but requires Internet access.